Hay fever is a bit of a misnomer because it isn’t caused by hay itself, nor does it produce a fever. Hay fever, more appropriately allergic rhinitis, is caused by uncontrolled swelling of the inside of the nose due to an allergen. The most common allergens are trees, grass, weeds, mold spores, cat, dog and dust mites. Symptoms of allergic rhinitis may include runny or stuffy nose; postnasal drip or drainage; sneezing; itching; dry cough; earache or a stuffy ear feeling; headaches; and a temporary, partial loss of some senses including taste, smell and hearing. Other secondary or less common symptoms may include an upset stomach and nausea. Severe rhinitis symptoms may interfere with sleep and cause excessive fatigue. 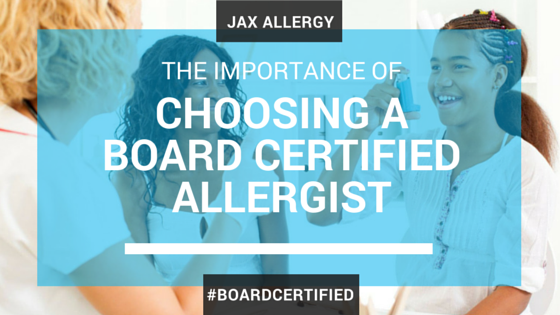 Upon identifying your specific allergens, appropriate control of your environment is a very important starting point. For relief, Allergy & Asthma Specialists of North Florida can prescribe a range of allergy treatments including nasal corticosteroids, antihistamines, decongestants or leukotriene modifiers. In those patients who do not respond to medications, prefer not to take medications or are limited by the cost of allergy medications then allergy shots (immunotherapy) may be an excellent treatment option. Our experienced allergists will customize your personal allergy treatment based on your medical history and your lifestyle. If you need relief from your allergy symptoms, schedule an appointment at one of Allergy & Asthma Specialists of North Florida’s four Jacksonville-area locations in Orange Park, Mandarin, the Westside or on University Boulevard.